The advantages of DVD and Blu-ray recordings of opera and ballet are clear – we get to see the action with the original text or translation as a sub-title in the case of opera. Though far too many productions spoil the effect with unnecessary tomfoolery and the camera-work is not always flattering to the performers, much is usually lost by listening to such recordings in audio only. I do, however, sometimes find a particular production so intolerable that I have to resort to the audio-only option – no names no pack drill on this occasion, though I will mention an honourable exception which I have reviewed recently: Richard Strauss’s Ariadne auf Naxos on a Virgin Classics DVD (6418679) with Deborah Voigt, Natalie Dessay, the Metropolitan Opera and James Levine. The situation, however, is necessarily different in the case of orchestral music. Too ‘busy’ camera-work can easily detract from enjoyment. The line is very fine – it may be right to focus on a particular instrumentalist whose contribution might otherwise go unnoticed, but distracting to see his designer stubble or to have a view of her nostrils. The BBC usually manage video broadcasts of recordings from the Proms extremely well, as do ORF for the Vienna Philharmonic New Year’s concerts. On the other hand, I had to play a recent Aix Records Blu-ray disc of chamber music by Shostakovich, Debussy and Brockman on my audio system because of constant shifts of angle and the visibility of even the camera-track and other recording paraphernalia. This Euroarts Lucerne Festival recording and production falls between these two stools – on the whole the camera-work is on the side of the angels, though there were occasions when I thought it unduly ‘busy’. One review which I have read suggests that it’s ideal, another that that it is too often frustrating: both are partly true. Having watched it several times now, I imagine that I shall in future mostly be playing it via my audio system, thereby deriving the clear benefit which Blu-ray brings over DVD and CD as an audio carrier. The sound is indeed very good when heard via television speakers and excellent when played via an AV receiver and large speakers. You wouldn’t normally expect a programme like this on CD or SACD. My first reaction, therefore, was to wonder whether a combination which clearly worked so well at the Lucerne Festival would stand repetition in a recorded format. In fact, the arrangement works very well, even for repeated viewing and hearing. Yuja Wang and Claudio Abbado combine youth and experience in the Prokofiev and the combination is extremely successful. It transpires that Abbado saw Wang play the Liszt Piano Sonata on French television and was so impressed, comparing her with Martha Argerich no less, that he invited her to perform with him in March 2009 and again at that year’s Lucerne Festival. The Prokofiev Concerto was apparently Abbado’s choice of repertoire, but in the event he could not have chosen more happily as an opening for the concert. Bob Briggs thought Wang’s recording of a very mixed recital of music by Stravinsky, Domenico Scarlatti, Brahms and Ravel a fantastic achievement (DG 477 8795, ‘Transformation’) though he was less impressed by the notes in the booklet. He takes the words that I was going to use of her Prokofiev out of my mouth when he uses such epithets as ‘stunning’ and ‘astonishing’ and when he writes of her playing like a demon and interpreting like an angel. All of which, despite my comments about seeing as against hearing, is clearly heightened by the vivid red dress which she wears – not the more sober one illustrated in the booklet. There is very strong competition for recordings of the Concerto: Ashkenazy and Previn (all five concertos on Double Decca 452 5882) and Argerich and Dutoit (Nos. 1 and 3, plus Bartók No.3, EMI 556654) to name but the two most obvious. Abbado has performed this concerto with Martha Argerich, so it’s not surprising that he chose to accompany here the pianist whom he has compared with Argerich, with whom he recorded the work for DG in the 1960s. Only a slight tendency to rush at times prevents me from giving this combination the strongest possible recommendation. 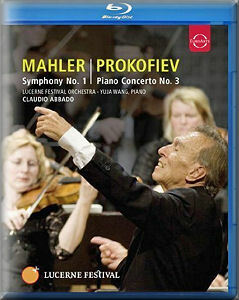 Abbado and the Lucerne Festival Orchestra go together naturally and, since Abbado is also a veteran Mahler conductor of distinction who has performed and recorded the composer’s music with them so successfully, it’s hardly surprising that the partnership comes off so well again here. It’s almost invidious to select, but I’d choose as most significant the way in which Abbado stresses the music’s kinship with birdsong, his wholly natural use of rubato and, above all, his demonstration that this was a First Symphony in which the composer’s maturity is manifest – even Brahms didn’t achieve that, for all that he waited so long. The performance of the finale brings the house down; it deserves and receives a tremendous ovation. If you began with any doubts about the order of the two works on the disc, you will soon forget them – to follow this Mahler First Symphony with anything else would be sacrilege. I shan’t be dumping my Kubelík CD, with its superb bonus of Dietrich Fischer-Dieskau in Lieder eines fahrenden Gesellen (DG Originals 449 7352) but I shall be playing Abbado pretty frequently too. With such excellent performances presented in such sharp picture quality – full 1080p on Blu-ray, which I imagine is superior to the DVD – and in such excellent sound, my only reservation must be the high price which Euroarts set on their DVD and Blu-ray recordings. In this case, the product is well worth the asking price: it’s not surprising that the DVD version was a best-seller for our partner suppliers at MDT last year.